The Commonwealth Morris Men, based in Greater Boston, is a men's morris side that has been dancing since 1993. Morris dancing is traditional ritual dance and street theatre from England that is associated with bringing luck, prosperity, and agricultural fertility to the community. This living and constantly evolving tradition dates back at least 500 years, and is mentioned numerous times in the plays of William Shakespeare. It is also great fun! The Commonwealth Morris Men performs at a variety of locations and venues, including gatherings of Morris teams from around the world. Morris tends to be seasonal and to focus on springtime and early summer, but there is dancing and singing to be done all year round. 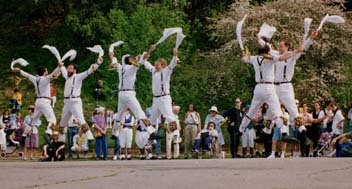 The basics of Morris are very easy to pick up; all that is needed is a willingness to jump around waving handkerchiefs at other dancers in time to music. Sound like a good time? It is! COMMONWEALTH IS LOOKING FOR NEW MEMBERS! We practice on selected Wednesday evenings, except during the summer. From September through April we in Belmont, 8:00-10:00PM, at Payson Park Church. In May and late August we meet in Cambridge, 7:30-9:00PM, on the Cambridge Common (weather permitting). IMPORTANT NOTE: We do not meet every Wednesday evening from September through April; please contact us for a current schedule of practice dates. Why not contact us and find out how you can join the fun? We are always eager to meet people interested in traditional dance and song. Good friends and good fellowship await those men who join our ranks. You can also download our current team flyer (PDF format) or check out our upcoming schedule. Information about morris-related teams and events in Greater Boston can be found at Jeremy Kessler's Greater Boston Ritual Dance & Drama site. Information on other areas and on Morris in general can be found through Rich Holmes' Morris Dancing Wiki, John Maher's Mainly Morris Dancing site, and Jeff Bigler's Morris & Sword Dance Side Contact Information. This page belongs to and is maintained by Jeremy H. Kessler. It was last updated on 23 October 2011.